Former President, Chief Olusegun Obasanjo, said yesterday that no right thinking Nigerian would applaud the current situation in the country, adding that Nigeria deserved better. He also said if opposition parties in the country refused to act together, the current situation in Nigeria would continue after 2019 elections. 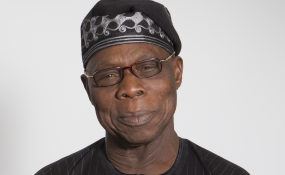 Obasanjo, who spoke when former governor of Sokoto State, Alhaji Attahiru Bafarawa, visited him at his Presidential Library in Abeokuta, said if the opposition continued to pull in different direction, Nigeria's situation might not change. Meanwhile, Minister of Information and Culture, Alhaji Lai Mohammed, could not be reached last night to react to the former President's statement. He said: "If we do not act together, Nigeria will not be what it should be in 2019. The objective must be clear that only one person will be President of Nigeria but if the opposition starts going in different directions and pulling in different ways, Nigeria's situation may not change" . "With a population of 200 million and for us to continue to complain shows we keep doing the same thing we have been doing. If we want a different result, we need to do things differently. "The situation in Nigeria today is not a situation which any right-thinking Nigerian will applaud and my strong belief is that Nigeria deserves better than what we have right now." Calling on all opposition parties to work together, he said: "What I will say is that if we do not act together, Nigeria will not be where it should be by 2019. Aspiration yes, but we must be objective together. "I want to thank you for coming to seek my fatherly advice on your presidential aspiration. When we were in government between 1999 and 2007, we both disagreed on many issues but our disagreement was based on principle but we still worked together eventually. "So your desire is to see what you can do to make Nigeria better than what it is right now and I believe there is nobody that wants a better Nigeria that will not want to contribute his own quota." Speaking on his Presidential aspiration, Bafarawa said he decided to visit former President Obasanjo to seek his advice and blessings ahead of his declaration. He said: "I came here to see Obasanjo because he knows what I have done, what I can do and he has confidence in my ability and capability to run for the number one seat in Nigeria. My achievements as governor of Sokoto State is a yardstick to measure what I can do for this country." . Speaking on the defection of Tambuwal, Bafarawa said: "I believe Wamakko is not a politician, if he is a politician, even as Tambuwal has defected, he should have respected his right to decamp. "What is the essence of him trying to show popularity in Sokoto. If he thinks he is popular, he should wait till the day of election to show he is popular but with what I saw yesterday, Wamakko is too big to be doing that to his own younger brother, Tambuwal."